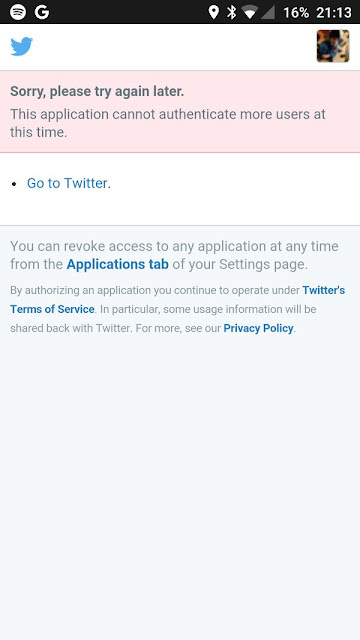 Here is some bad news for another third-party Twitter app i.e. Fenix. Fenix app for twitter has finally hit the roadblock of twitter's token limit of 100,000 which basically means that new users who buy Fenix from now on won’t be able to sign in to twitter using the Fenix app and hence can’t use the app. This is not happening first time for a third-party twitter app. Before Fenix, the other popular app that hit the token limit was Falcon Pro long time back.
.@RELPLT sorry, it seems that Fenix finally reached Twitter tokens limit, and it cannot serve more users. Send me an email for a refund. The token limit issue popped up when one user tweeted about the error that he was getting it while trying to sign in twitter using the Fenix App. This application cannot authenticate more users at this time. The token limit was then confirmed by the developer itself when he replied to the user and promised a refund. Just sometime after this tweet, the developer has removed or unpublished the Fenix app from the Google Play store now. We are not sure if it will ever return back or if it returns then in which form. Twitter token limit is responsible for demise of most of the third-party twitter apps and Twitter is not ready to change this anytime soon. We do hope that this changes, but the chances are bleak. We will be tracking this story and keep you updated. Stay tuned to Kickedface.